2 Beds 2 Baths 2,129 Sq. ft. Hurry! Entertainer's delight in this spacious open floor plan. 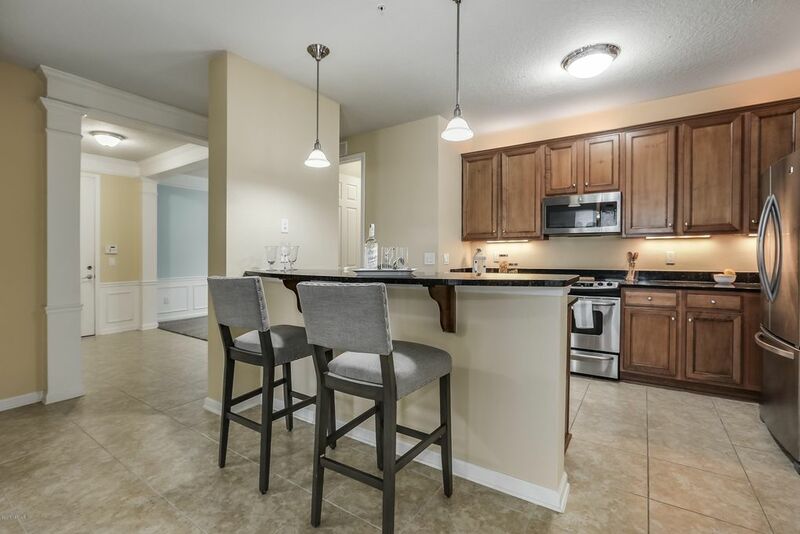 Care Free Living Condo in Jacksonville's #1 Active Adult creating the Ultimate lifestyle in this 55+ Age Restricted community. This Monte Verde floor plan, end unit has abundant natural light throughout. Kitchen has 42' maple glazed cabinets with crown molding, granite counter tops, SS appliances, breakfast bar and some updated lighting. Owner's suite is generous and bath features raised vanities and new back splash. Outside storage on the lanai. Ground floor unit allows you direct outside access to take that four legged family member for a walk. Swim all year long in the indoor, heated pool or the one outside. Del Webb's clubhouse boast a beautiful resort style pool, indoor pool, Jacuzzi, fitness facility, ballroom, billiards and over 50 clubs to join with an opportunity to make new friends instantly! SWEETWATER residents enjoy the fabulous 22, 000 SF amenities center, Summerland Hall, w/state-of-the-art fitness facility, indoor & outdoor heated pools, game & crafts rooms, library, business center, yoga/pilates room, billiards room, -- all staffed by a full-time Lifestyle Director. Tennis courts, bocce ball courts, outdoor pavilion for picnicking, lighted walking/nature trails, bike lanes, & more! Directions: From I95 east on Baymeadows Rd., turn right on Sweetwater Pkwy and to guest entrance. Push button and ID yourself as Realtor.Make and immediate right. Facing building 2 unit is far left unit.